Since British Colonial times, Uganda has produced high-quality cotton. The deep, rich soil, and plentiful precipitation yield bountiful crops. Cotton is also a valuable cash-crop, providing rural farmers with resources to pay for children’s school fees, medical expenses, and transportation. Processing cotton bolls produces much nutrient-rich organic by-product… but what to do with it? Solution: grow mushrooms to transform the cotton waste into nutritious food & profit! This Farmer Co-op used the internet to research the methodology to grow mushrooms, by packaging the cotton waste in recycled shopped bags. 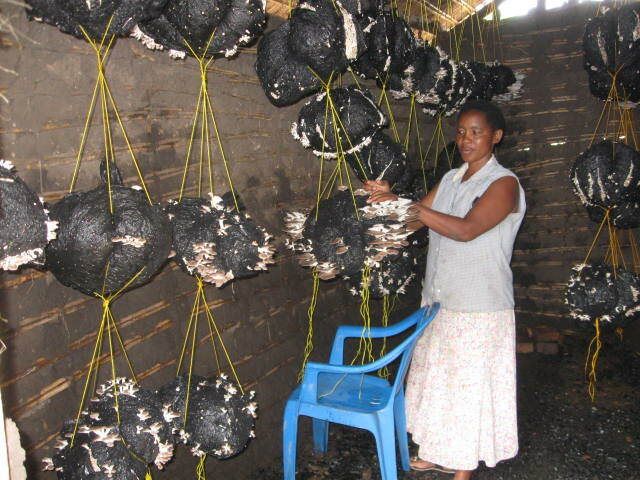 Using an organic fertilizer, these mushrooms are ready for consumption and sale in only a few weeks. Turning a potential waste into food and profit, and providing employment to the area. The I4H donated ICTC provided the tools to research opportunities and methodologies for their farm, allowing these local farmers direct access to mushroom cultivation best-practices, AND marketing opportunities.